I do not understand Nepal Volleyball Association's stance that volleyball players from the Nepal Army will not eligible for selection to the SAF Games squad because they will not be competing in the ongoing national volleyball league. 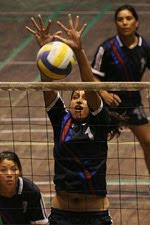 Unlike in swimming and athletics there is no qualification system for players in volleyball. Either you are good enough for the national team or you are not. Obviously the national volleyball team coaches know who the best players in the country are - regardless of what tournaments they participate in, so shouldn't they simply be able to pick the best players out there? As for the Army's withdrawal from the volleyball super league because of PLA's participation, to me, it does have merit. Unlike the Armed Police Force in football who were given direct entry into the Martyrs League 'A' Divison, the PLA qualified fair and square for the volleyball super league. No team should have the right to pick and choose who they play against. If Army wants to boycott a team - they should stop playing APF in football.